I’d previously tested transferring individual files via RS232. 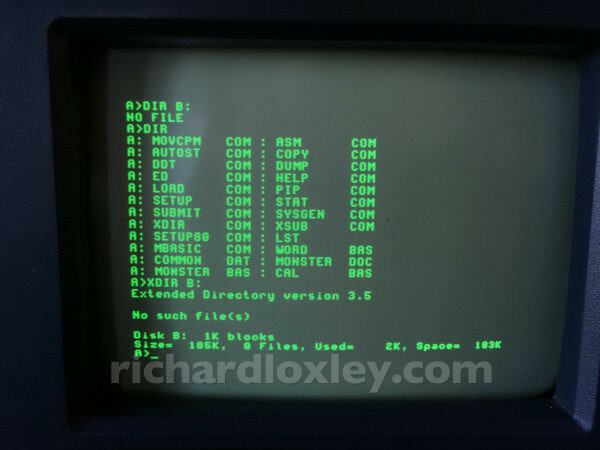 In those tests I used PIP at the Osborne end, which can only handle small files. That’s because it has no flow control, so when it needs to stop and write its memory buffer to disk, it doesn’t pause the transmitting end. Supposedly using a more advanced tool such as Kermit would avoid those problems. However it is still slow and laborious. By default the Osborne serial port works at 300 or 1200 baud. From the technical manual, I did find there is an internal jumper (J1) on the motherboard. If you remove the jumper then it doubles the speed of the serial port to 600 or 2400 baud (the software still reports it as 300/1200 though!) I tested it at 2400 baud successfully. There are additional connection points on the motherboard where you can make modifications to select even higher baud rates (according to the technical manual). However it warns that due to the clock speed of the motherboard, the highest speed the Osborne can receive is 2400 baud. The modifications are purely for one-way communication from the Osborne at higher speeds (e.g. to a printer). So RS232 is probably not the best way to go. Disk images seem a better solution, given I now have a USB disk emulator that works well. But I needed to find a way to edit them to insert individual .COM and .BAS files. cpmtools (home page / GitHub link) – will access individual files on a CPM disk image (but only for IMG/RAW images). disk-analyse (part of Disk-Utilities) – will convert IMD to HFE and back again. Will convert IMD to IMG/RAW, but not back again (I couldn’t find a way to tell it about the geometry of the raw image). It didn’t seem able to convert directly between HFE and IMG (it crashed with a segmentation fault when you try). dsktrans (part of libdsk / GitHub link) – will convert IMG to IMD (if you tell it the disk geometry); will also read TD0 files. HxCFloppyEmulator (download page) – will convert to/from HFE format (using a GUI) – I personally prefer other command-line tools though. I found that some of the packages were available pre-compiled in the Homebrew package manager. cpmtools can read/write individual files in IMG/RAW disk images formatted in a variety of common CPM formats. It adds the following commands: cpmls, cpmcp, cpmrm, cpmchmod, cpmchattr – which are equivalents of the UNIX ls, cp, rm, chmod, chattr. I did find that as of commit 3ec1cff (27 March 2018) it wouldn’t compile without errors on macOS High Sierra. I detailed some changes that would allow a successful compile in Issue #58. They seem to work for me, and hopefully don’t break anything! Hopefully this will be corrected in the future, so these edits may not be required. You will need macOS development tools installed. I already had Xcode installed along with the command-line tools. It’s important to note that disk-analyse uses the file suffix to infer the disk image type – so you may need to rename files accordingly. disk-analyse can’t do IMG to IMD as it doesn’t know the geometry of the raw IMG format (it gives the error “more than one format specified for IMG disk”). The implication is that it could do the conversion if you can specify the disk format. But I couldn’t find a way to add the Osborne 1 format. I also found that if I tried to convert HFE to IMG or IMG to HFE I just got an immediate segmentation fault (I think it was in strcmp?) So instead I needed to convert via the intermediate format of IMD. dsktrans is part of the libdsk package. Finally, with all these tools installed, I developed a workflow. The most useful disk format for me is HFE, as that’s what it needs to be for the Osborne to read it via USB. 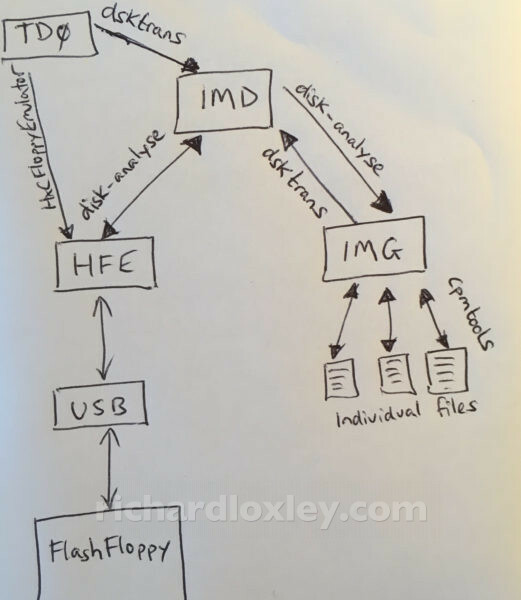 So I wrote two shell scripts that would convert downloaded IMD or TD0 images to HFE: imd2hfe and td02hfe. In order to manipulate individual files via cpmtools, the images would need to be in IMG/RAW format. So I wrote two shells scripts that would convert directly between HFE and IMG/RAW (via intermediate IMD files): hfe2cpm and cpm2hfe. I already had a script hxc_eject that would unmount a USB drive, remove all the extraneous files that macOS installs on it, and sort the FAT filesytem into alphabetical order. (The name is because I originally wrote it for the HxC floppy emulator). You can find all these scripts on my GitHub page. 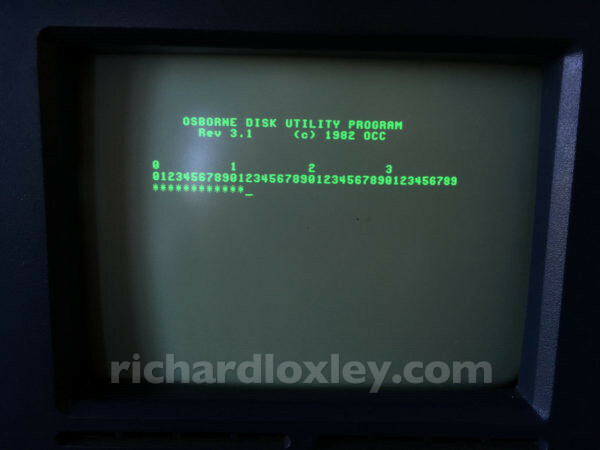 For future use I copied an existing HFE Osborne 1 disk image onto my USB stick, and then used the Osborne COPY command (selecting option F for Format) to format the image.